It only takes about 5 minutes to create your first event on Billetto, even if you haven't done it before. Pick the name for your event, make it short, snappy and to the point. Mention who's hosting it - in case your guests want to look up similar events from the host. Select the date and location. When you pick the address for your party it will show up on a map alongside your event. Finding your party could not get any easier. Let your imagination fly. Write a thorough description of what your guests should expect, spice it up with pictures and videos and set out the rules, if there are any. Lastly, choose a category for your event. This makes it easier for other Billetto users to find your event when they're browsing around for places to go. Choose the ticket types you'd like to offer to your guests. Hosting a free event? Select "Free ticket" or "Sign Up" option to create exclusivity or to know exactly who and how many are coming to your event. Tip:Upsell. Add an option to buy merch, books, any extra thing you will be offering at your event. Making it easier for your guests to buy these extras will increase your overall sales. A picture speaks a thousand words. Yes, a cliché, but when your potential guests are browsing for interesting events to go to, it's the picture that catches their attention first. Make sure that the image you choose goes along with your event's mood and aesthetic. Oh, and go easy on text, keep it for your event's description. Tip:Don't have a good picture to illustrate your event? There are many free stock photo websites that can help you find a pretty image. Check Unsplash, for example. Not finished editing your event? Save it for later. All done and ready to go? Press "Publish" and start selling your tickets right away or select a date you would like your event to be published on. Tip:Don't want people to search and find your event? Un-tick the "Public" box and keep your event private. Now that your event is online and tickets are up for sale, it's time to get it noticed. 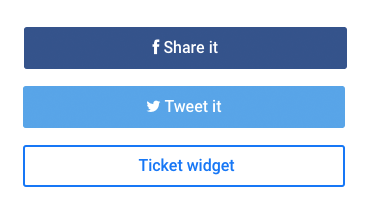 Share the event on your social media, embed the ticket widget directly on your website or send out email invitations to your existent email contacts. Tip:Don't know what a Ticket Widget is? Read our step-by-step guideto help you with embedding a Billetto Ticket Widget on your website. Well done, you should be all set with selling your tickets. If you need help with managing and planning your event, check the Billetto Event Management Guideand the Event Planning Guide for more tips and tricks for running successful events.